With short-cropped pants, palazzo pants, tights, pajamas, skinnies, and with cigarette pants, one common and most favored latest trend for this year which looks cool with many types of lowers is the Kurtis/ tunics trend. Being the hottest chic fashion statement of a million of girls over Pakistan and many other countries like Bangladesh, India, and some western countries too, this dressing theme has won hearts of teenager and little girls at a high number. Stitching of such shirts slightly differs from stitching a kameez or frock. 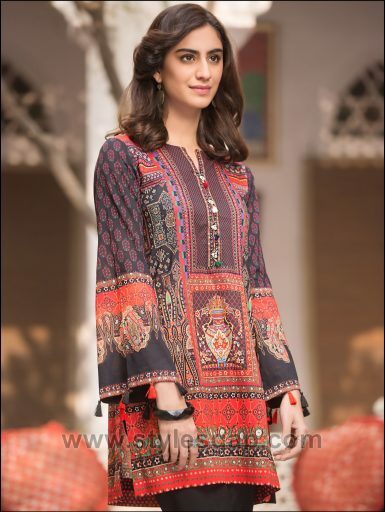 Here we are sharing the Summer Fashion Lawn Kurti Designs Trends Latest Collection. As this trend has overtaken all the others because of it being simple yet trendy for both casual and formal purposes; all the famous and struggling designers are very keenly experimenting and releasing stuff of such kind in their new arrivals for this season. Casual or semi-formal ones of them are plain of having funky arts like cartoons, Asian truck art theme prints, quotes written and light embellishments, etc. on them, and the formal or party wear tunics have embroideries, nice buttons, and laces. Most of the Pakistani branded shops like breeze, rivaj, limelight, alkaram, Zeniya Lawn,Rabea by Shariq, origins and many others have a huge variety of funky as well as elegant embroidered kurtas When the local markets and designer boutiques are so filled with this dressing theme, our style conscious platform won’t slip from fulfilling its duty; and so we’ve got this post for you to have a know-how of the latest trends and innovations in the typical kurtis by designer brands of all the regions. 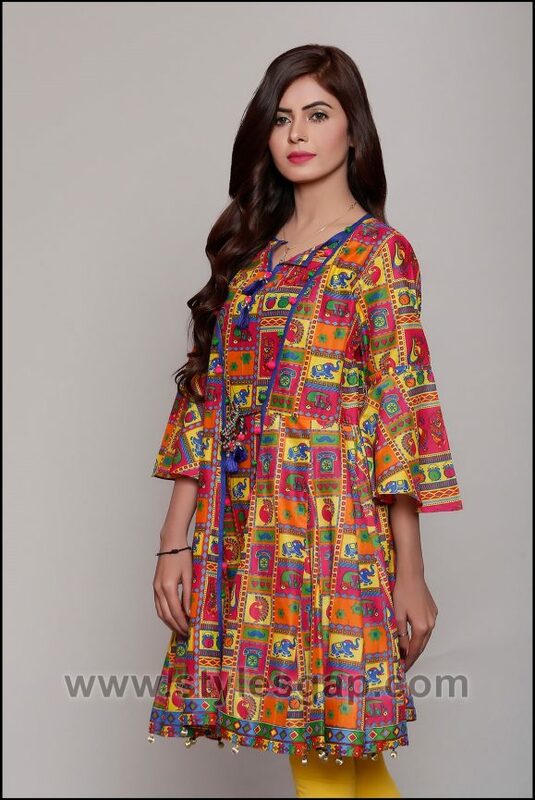 Summer Fashion Lawn Kurti Designs Trends Latest Collection has a diverse range of shapes, makes and styles in the latest short and medium length tunics. 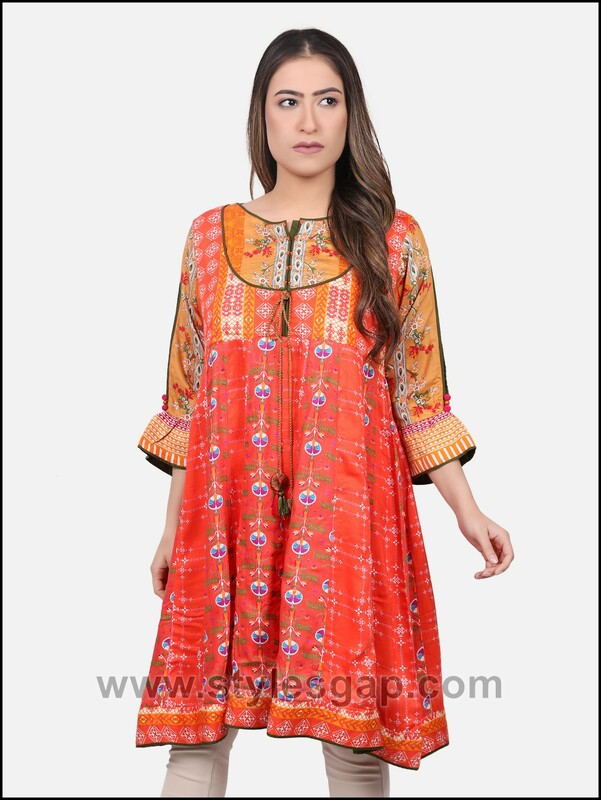 These include plain or printed kurti, patched, beaded and embroidered formal kurta style, tailed kurti, flared frock style, t-shirt styled tunics, and many other variations. Floral patterns, geometric, ethnic, Egyptian inspired, block prints, animal prints and many others are common these days. Embellishments that adorn some of these outfits are thread work beads work, intricate embroideries, patches and lacework, etc. The latest summer shirts and tunics make a girl enjoy her days and nights in a comfortable style yet being up-to-minute. So for this summer socialize in trendy and cozy tunics, enjoy your tea parties, hiking, tours, hangouts, and birthdays in a comfortable and adorable outfit pairing a kurti with a bottom of your choice. Check out the amazing chic designs of latest summer lawn kurta trend posted for you below!